As the largest city in South Africa, Johannesburg has a thriving population of over four and a half million. If you are visiting the city within the next year, you will have done some research and found a few locations to visit. However, you only have a certain amount of time so what do you choose to visit and what do you leave? Of course, this is a tricky question but we have our top five suggestions. Apartheid Museum – Whenever you visit a new country or city, it is always interesting to find the history so you can get a better feeling for the area. In Johannesburg, there is nowhere better to do this than the Apartheid Museum. Although it won’t take all day, it will provide you with a valuable insight to the history of the country. What’s more, you can make the most of TV news reels, pictures, historic document, film, and more. Neighbourgoods Market – Primarily dealing in foods, this market gives all visitors a chance to sample the local cuisine. Not only are the prices affordable, vendors are normally happy to take the time to talk to guests about the food. As well as Japanese and Korean, you will also find American, Mediterranean, and of course, local flavours. Perhaps most impressively, you get to see the varying cooking methods that are used. Wildlife Tours – What trip to South Africa would be complete without making the most of the nature on offer? Throughout the city, you will find information on numerous tours and safaris that will take you into the wild and show you animals in their natural habitat. If you want to create memories to last a lifetime, this is certainly one way to do so. Constitution Hill – If you’re interested in history, this is the place to visit as the location was previously a fort before then being transformed into a prison. Just before the 20th century, the fort was built to protect the Republic from a British Invasion. Soon after, leaders of the Boer were imprisoned during the Anglo-Boer War. Nowadays, it is home to the Constitutional Court of South Africa and contains an art gallery and beautiful views over Johannesburg. 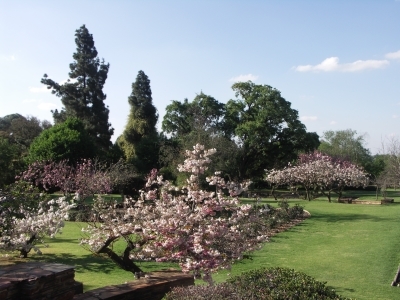 Botanical Gardens – After being established in the mid-1960s, these gardens cover around 1.25 square kilometres and is currently looked after by Johannesburg City Parks. Just to the east of the gardens, you will also find Emmarentia Dam which is made up of lots of small dams. Both of these locations offer magnificent views and a good chance to take in the beauty of South Africa. There we have it, five superb day trips in Johannesburg. As long as you tick one or more of these items from your list, you can consider your trip to South Africa a success. Whether you are interested in nature, wildlife, food, or history, these are some superb choices!